Most of the people are lazy to make household budget plan. They sit back and enjoy life as it comes. They spend money every day on things that they do not need rather than on things that are actually essential. Many of them are not bothered to track their spending. Due to this one day they may trap in to a situation when they will need money for an emergency such as an accident, the treatment of a disease or a loss of job. At this time, they will realize that they do not have any resource to dip into during emergencies. Hence, it is very important to have a family budget plan to track expense & saving. Keeping track of family finances is very difficult task without a proper household budget planner. Often, a spouse is in charge of all financial matters and it can become daunting, especially at month or year end. Finances are something that many shy away from because of the lack of incoming funds and abundance of outgoing funds. Creating a household budget can be a lifesaver. By creating a budget you can better see where your money is going and where it needs to go. First thing you need to do is know your monthly income. This will help determine how much money you have coming in each month. Now start exercise of knowing your monthly expense. First task you need to do is break your expense in list of categories like grocery, cloths, utility bills etc. Make sure to include both fixed (e.g. rent) and variable expenses (e.g. groceries). For making list more accurate you can use your bank statement. This is applicable if your spending is through cheque or credit card & if you spend money in cash than get maximum information from last month bills. Now you know your monthly expense it is time to make budget. Creating a budget may not be exciting task, but it is vital in keeping your financial house in order. Budgeting is also required to control your expense. 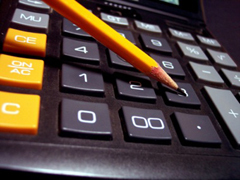 Draw your monthly and yearly budget based on monthly expense. When you were going through list of expenses you might have notice that some expenses are necessary, but can vary from month to month. Examples include groceries, utility bill, dining out, entertainment etc. Determine the expenses that fall into these variable categories. If you feel you are spending more on any category item, create simple budget (amount) for that category and monitor your spending’s with respect to budget limit you have set. If you make purchase with credit card or debit card make sure to check your statement on weekly basis to see you are within your budget or not. If you are spending money by cash, then withdraw monthly budgeted amount at beginning of month and only spend the cash that you have. Simple Excel sheet is attached herewith you can use this to track your expense. Family budget planners are crucial to ensure we have a good understanding of our family financial situation. Begin a financial record to get a true picture of your family earning and spending. Given budget planner if used properly can help you to limit unnecessary expenses and let you know exactly how much you can afford to spend on non-essential items. A family budget can even help you to set up savings for the future and establish habits in your children that can assist them later in their lives.